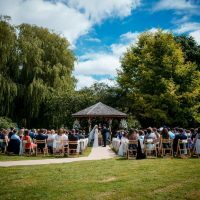 Set in the heart of glorious Oxfordshire countryside, Worton Hall provides a romantic venue for weddings, civil ceremonies and celebrations. The site has a fascinating history stretching back to the Iron Age with archaeological artefacts from Roman and Saxon settlements. Following a thoughtful restoration, the former grain store barn offers a choice of delightful indoor and outdoor settings. 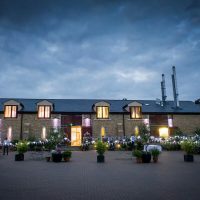 Supporting the rich diversity of modern life, Worton Hall caters for a wide range of cultural and tradition weddings, including Hindu, Muslim or Sikh ceremonies. 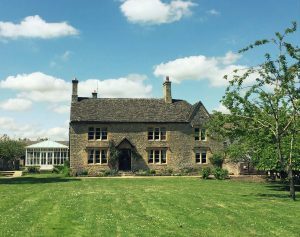 Luxuriously refurbished Cotswold stone cottages provide plenty of accommodation for the happy couple, the bridal party and family. The cottages provide accommodation for 2, 4, 12 or 22 guests and make a relaxing base for extending your stay to explore the local attractions. Choose from a selection of romantic indoor and outdoor reception settings to host your guests. 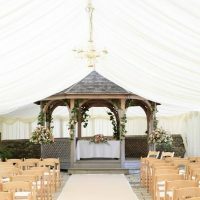 If you fancy making your vows outside, the Main Square Courtyard, serene Poolside and Farmhouse Green provide memorable settings. During inclement weather, the Mezzanine Level of Hayloft Gallery makes a charming indoor space. With three indoor and outdoor licensed settings to choose from you can create your memorable day your way with space for 60 – 350 guests. The Farmhouse Green and its picturesque wooden Pagoda create a stunning backdrop to your ceremony. Under the steady gaze of the grade II listed Farmhouse, enjoy spectacular views of the weeping willow pond and Worton lake as you tie the proverbial knot. The mezzanine in the Hayloft Gallery is neutrally decorated and lit with rustic antler chandeliers. Ideal for larger celebrations the Main Hall is an elegant fusion of traditional features and contemporary décor. 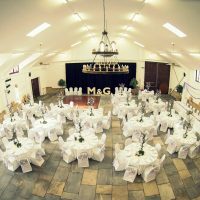 Featuring stone tiled floor and three statement wooden chandeliers, this impressive hall can be combined with the mezzanine for extra versatility and space. Whether you fancy a four-course formal dinner, summer picnic or cheeky buffet, there is something to suit all budgets and preferences. Feel free to use the services of our recommended caterers ‘Greens Catering’ or arrange your own catering company. Greens Catering can help you design a bespoke menu to tantalise the taste buds whilst accommodating any specific dietary requirements. To discuss your needs and options, please call or take advantage of the online enquiry form on the website.